Before you return to campus, you might be staring at a to-do list that looks something like this: Pick a federal or private student loan, wrap up your summer work, and pack up your car. But you should add one more item to the list: Download money-saving apps. 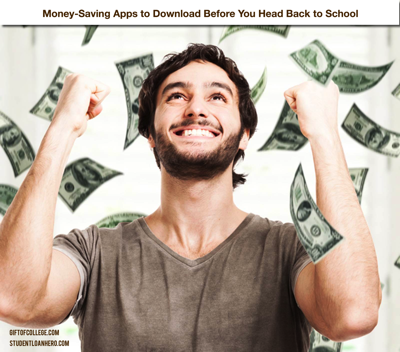 The following five apps will help you budget, save, and earn cash with minimal effort so you can focus on what's essential — another year of college. There's no shortage of budgeting apps, but with an average rating of 4.8 out of five on Apple's app store, Mint is among the best. It offers a one-stop shop for your individualized financial needs — everything from setting up payment reminders to tracking your net worth. At this stage in your life, you might be budgeting your expenses for the first time. With Mint, you'll appreciate that much of the math is done for you. The app will categorize all your spending once you connect your bank accounts and credit cards. Mint's user interface is helpful no matter how often you check the app on your device. Easy-to-read charts explain where your money is going, and progress bars show how much room remains in your budget. The visuals will help you identify trends in your spending. You might discover, for example, that you're spending more than you should on specific categories, whether it's Chinese takeout or your morning coffee. If you're a beginner and aren't interested in housing all your finances in one place, you might opt for a simpler budgeting app like EveryDollar. You'll have to add each transaction to your budget manually, but that could make you even more aware of your spending habits. You might find that most of the expenses in your budget are shared, either with a roommate or with a parent who's helping you afford the costs of college. If that's the case, you'll benefit from a bill-splitting app like Splitwise. You can request or send money to your roomie or mom or dad with a few taps of your fingertips. Also, you won't need to check in with them if they forget to repay you, as the app sends reminders on your behalf. Splitwise also beats money-transfer apps like Venmo because it tallies up your list of bills and takes care of the addition and subtraction. Say you and your roommate split the rent as well as electricity, gas, and internet bills. When you add each bill to the app and mark who paid it, the app will determine who owes what. Between classes and extracurriculars, you might find the school year to be an awful time to save money. Digit can help. The app monitors your checking account balance and transfers extra cash to your Digit savings account on a daily basis. If you're a forgetful saver, Digit is right up your alley, as you likely won't miss the money that leaves your checking account. Plus, you can always access it from your Digit account. The company puts no maximum on the frequency of withdrawals. If you're a savvier saver, you might elect to sock away your extra cash manually. In that case, avoid Digit's $2.99 monthly fee and choose your own high-yield savings account. Just remember to make occasional transfers. Saving money is easier when you're earning money. And even if you plan to start a few side hustles, intern, or work when you return to campus, there are other ways — and apps — to earn a little extra. As a college student, you're probably all too familiar with buying expensive textbooks. BookScouter, on the other hand, allows you to sell them. Although there's a desktop version of the website, you might find that it's easier to use the app on your mobile device. All you need to do is scan your book's bar code, note its condition, and review buyback offers. BookScouter even takes care of the shipping costs. If you don't find appealing offers for a particular book on BookScouter, consider other options, including ValoreBooks. As a current student, you probably aren't too concerned about your student loans or other debt. After all, you have graduation, your grace period, and whole career in front of you. But for those of you who'd like to get out ahead of your debt repayment — and save on interest as a result — consider downloading Qoins. The app rounds up your purchases to the nearest whole dollar and puts the change into a savings account. Then, the account's balance is directed to the debt of your choice. For example, you could begin paying off your federal student loans a little bit at a time. Even smaller payments can help you wipe away accruing interest. The app functions similarly to Mint in that you'll need to sync your payment accounts. For this service, you'll be asked to pay $1.99 per month. That's not much when you consider that the company claims its average user pays off their debt two to five years early. If you're determined to pay off your student loans as quickly as possible, you might opt for a more serious repayment app like Debt Payoff Planner. Your best bet is to find the money-saving apps that are right for you. They'll allow you get your finances in order without taking away from your life on campus. Thank you to Andrew Pentis our guest contributor from Student Loan Hero.